Thinking about becoming a top Chef? It took 105 years for Michelin to reach the United States. Founded by the Michelin brothers, Andre’ and Edouard, the guide was fist published in August of 1900 during the Exposition Universelle in Paris. An engineer (Andre’) and an artist (Edouard), the two brothers were also competitive auto racers who created the first detachable automobile tires. The little red guide book for motorists, and it quickly became Europe’s most popular travel guide. At first it was all about cars and places to stay. Suddenly you could go to Brittany and eat food there, whereas before you could only read about it. You could go to Burgundy, you could go to the Jura and up into the mountains, you could even go to Marseille. The trains didn’t serve all these places. 1920 the guide was no longer offered free; by 1923 it had added a new element: recommendations of restaurants independent of hotels. By 1926 the Michelin stars were born, not just the comfort of this or that hotel but the excellence of its kitchen as well. Eleven year later, the transformation was complete: the guide was devoted to Gastronomy. There are currently 24 guides for 24 different countries. 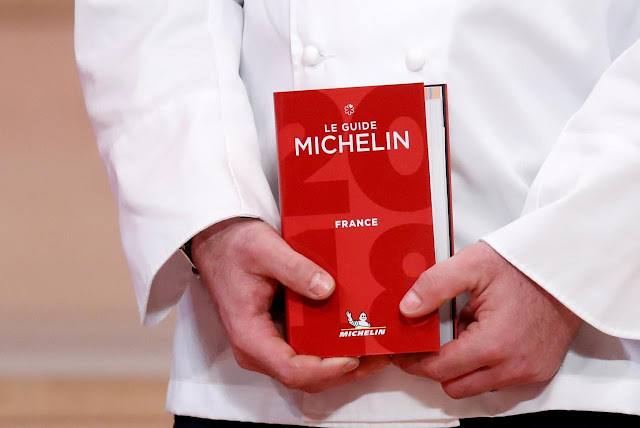 Their reach extends to Warsaw and Krakow, in Poland, Oslo, in Norway , Stockholm in Sweden and Athens, in Greece,… There are 33 stars in Japan as of so far compared with the 26 in France and 12 in the U.S. Michelin began rating restaurants in about the same time it did in Japan. At that time Japan and France had a symbiosis. Both countries had fantastic ingredients. They have an almost religious appreciation for produce and the seasons’ ingredients with tremendous techniques. This guide book went from a small travelers guide for the elite, to a guide to determined if you are actually worthy of serving clean, great quality foods by world renowned Chef’s. It is most coveted because it has literally been around the world and held by some of the most wealthiest people and places. By the way, if visited by any Food Blogger/Critic (well known on social media), Chef and friends, elite customers (celebrities, wealthy individuals)…you can actually lose your star. This is an embarrassment to any Chef in this category. It is up to that Chef to maintain a level of standards that are worthy of praise at all times. You always want your customers to return with praise and exceptional “word of mouth” comments. Get a guide book for your Country and/or City, if you’re thinking about reaching a level of Master Chef in the restaurant industry. I hope this gives some insight into the origin of this prestigious award. Maybe my next article, I will write about Mr. Boston the guide book for great Bartender’s.